Solutionz by Chicke Fitzgerald : Offline Strategy in the Wings for Leading OTA Expedia? 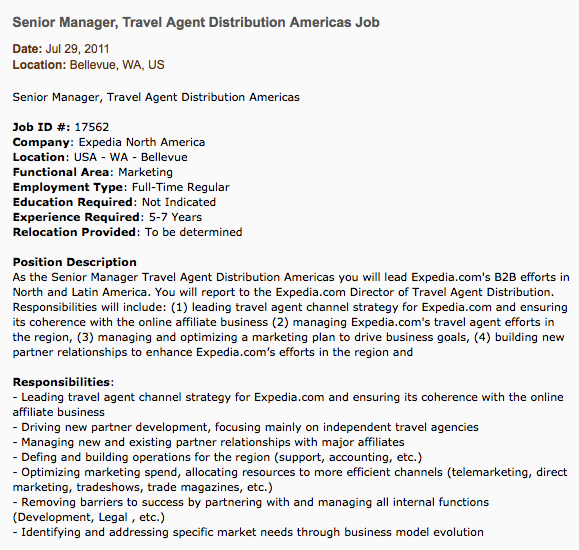 Offline Strategy in the Wings for Leading OTA Expedia? Occasionally, when you least expect it, you can get a view into a company's strategy from the most inocuous of places - their job boards. Since I'm updating my book on Multi-Channel Distribution, I have a Google Alert set up for distribution and today, up popped this job description. Now, maybe I'm the only one in the world who didn't know that #1 OTA Expedia has a strategy to reach offline agencies. If so, go on to read the next blog on your list. If not, then let me tell you my perspective. I have long believed that Sabre and Travelport missed the boat in not providing agencies a free, private label version of their online partner'sites (Travelocity and Orbitz respectively). At least for commodity product sales that would keep their agencies' customers with their agency, versus them leaching off to an OTA. Well, a decade of opportunity on that front has now passed and it would appear that in addition to their endeavors on the corporate travel side, Expedia is serious about tackling the travel agent distribution market. They are hiring a Senior Manager, responsible for North and South America, who will report to a Director of Travel Agent Distribution. Since there is so much upside opportunity, particularly on the hotel booking front for agencies, this is a very interesting strategy. Now, if Expedia would just catch the Project 85 Drive Market vision, their strategy would be complete, defensible and sustainable. Or maybe that is where the GDS companies and their online assets should go. Big market - big opportunity. Interested in the job? Click HERE.